Since my SEO review of WiX attracted a lot of attention, today I’m doing another review of another popular website builder, Squarespace. As with WiX, Squarespace also offers beautiful templates that makes it easy to create a professional looking website without paying big bucks to a developer to create it for you. 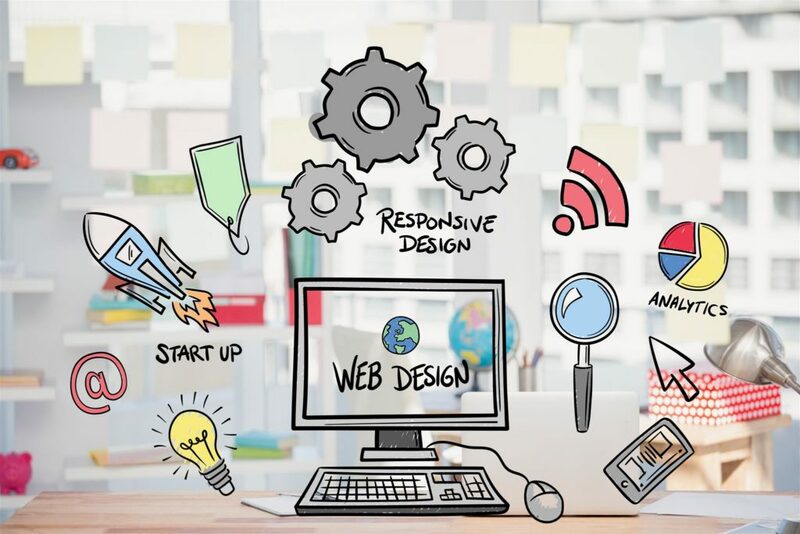 The flip side with any of these website builders is that you lose the ability to completely customize your site, including in some cases, the ability to fine tune certain on page SEO factors. But when it comes to Squarespace, we aren’t talking about a big brand with an equally big budget looking to capitalize on every competitive SEO edge possible. The typical Squarespace user is a small business that needs “good enough” SEO. So the question is, is Squarespace “good enough” and what are some of the “must knows” when it comes to SEO and Squarespace? That’s what I’m going to cover in this post. But first, let’s all get on the same page when it comes to successful search engine optimization. In 2018, when it comes to SEO (search engine optimization, which is the art and science of ranking well in the search engines), you want a good website that Google can crawl and understand, but this is just part of the picture. Great content and a user experience that is aligned with the searcher intent. Or in other words, when your ideal client or prospect searches for a solution or a product, your page needs to be a great match for their needs. SEO authority with high authority and relevant incoming links. Your website will perform better in the search engine rankings if you have trusted sites linking to yours. 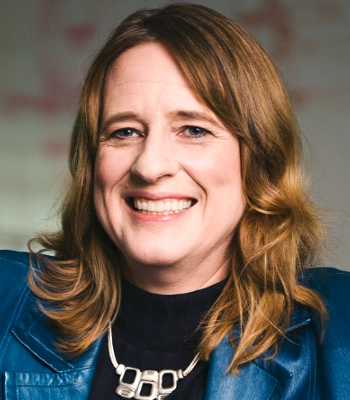 There are many facets to good SEO. 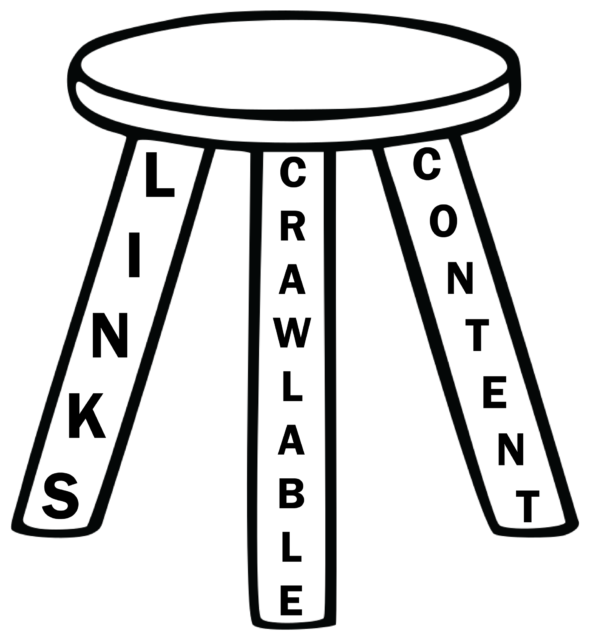 One way that I like to explain it is that SEO is like a three legged stool. On it’s own, your choice of a website platform isn’t enough to make your website an amazing organic traffic magnet. You need the other legs too. For this post we are going to focus on the “Crawlable” leg – in other words, the website needs to be easy for Google to crawl and understand – and that’s what we need Squarespace to provide to us. Performant: Site speed (how fast your website pages load) is a Google ranking factor, and more importantly a fast site is critical to keep users from abandoning your site. Mobile friendly: The site needs to look good on a phone. Tagged with keywords: Each of your site’s pages needs to have a unique and compelling keyword rich title tag and meta description. Structured data: Structured data isn’t a factor for ranking yet, but it does help the search engines understand your site better. Free of low quality pages: Your site should avoid having duplicate pages, and more importantly avoid empty or almost empty pages. Secure: Google gives a small boost in ranking to sites using HTTPS. Moving this blog to HTTPS is on my 2018 todo list, so I like to see website builders provide this option. XML sitemap generation A file that provides a list of pages to the search engines to crawl. To get an idea of a site’s performance I ran a GTmetrix test against the home page. Squarespace did well in this test, it only took 2.3 seconds to fully load the page. I would have been happier if the time to first paint was under a second, but 1.5 seconds is still quite decent, given that abandonment by users starts at 2 seconds. You can see the time to first paint if you create an account with GTmetrix and then re-run the test with the video option. GTmetrix had two complaints about the site. Images could be further optimized to be smaller in size. You do have some control over the first complaint, you can optimize your images prior to uploading them into Squarespace using tools like TinyPNG or ImageOptin, making your site speed performance even better. Still, overall a pretty decent result. All Squarespace designs are Responsive, which means they automatically adjust to the screen size of the device you are viewing the website on. From the SEO perspective that means you don’t need to do anything extra for mobile SEO, Squarespace has take care of that for you. 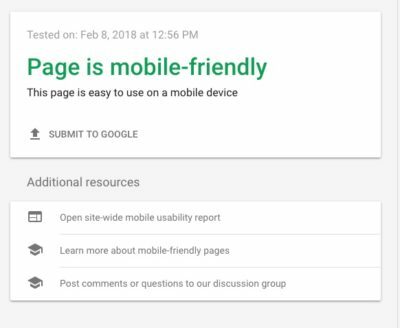 Of course, like with all sites, you should periodically review the Mobile Usability report in Google Search Console (under the Search Appearance section) to be sure there are no mobile usability issues, however so far I have not seen any issues with Squarespace. 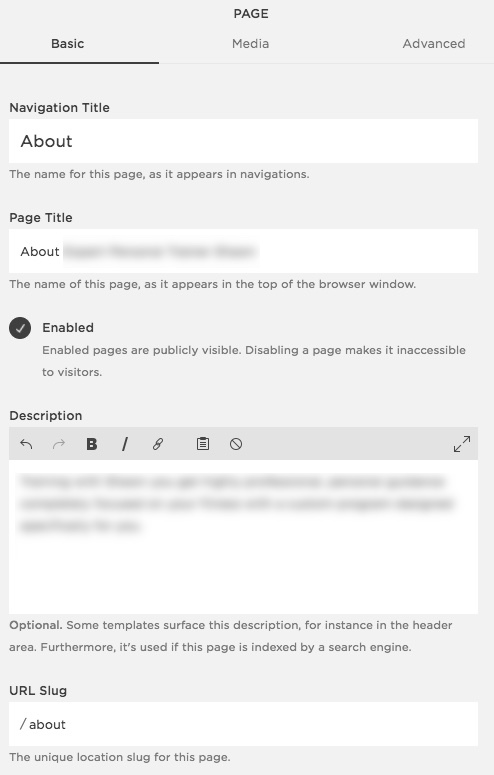 Using the Responsive approach does limit your ability to design a custom mobile experience, a capability you do have with competitor WiX’s mobile editor. Creating a distinct mobile experience takes time and resources and is not necessary for all websites, but might be something to consider if a high percentage of your visitors are on mobile devices and you want to give them a more custom interactive mobile experience. For 99% of the typical Squarespace users, Responsive should be enough. My example site had no problem passing Google’s mobile friendly test. One thing to mention is that Squarespace is using Google AMP for it’s mobile pages. AMP is a subset of HTML that is designed to render very fast. Additionally Google gives AMP pages an additional ooomph by caching them on it’s servers. Which is all great. However if you are using the e-Commerce features of Squarespace I would spend some time checking out the experience on mobile to make sure you are happy with it as AMP is still evolving when it comes to the more interactive features. 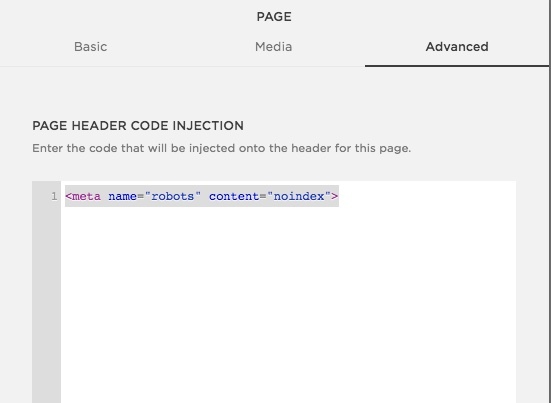 Like a lot of systems, Squarespace gives you the ability to customize your meta tags for the site and for each page. The title and meta description tags are often used by Google to create the snippet, that listing that represents your web page in the search engine results. Think of the snippet as the welcome mat for your page. You want that snippet to be, well, welcoming and clear! The title tag in particular is very important, you ideally want a keyword towards the front of the tag. And that tag, along with the meta description, has to do the job of selling the “click” to the searcher. Because what good is it to rank, if you don’t get the click? If want to learn how to write compelling tags that also rank, head on over to my SEO Copywriting post. First, head over to the SEO settings under WEBSITE for the site. This will allow you to set some defaults for the tags, which is especially important if you don’t customize tags on each page (which I highly recommend you do!). The “Search engine description” will become the meta description for the home page and any page that you don’t customize. For PAGE TITLE FORMAT, I recommend using %p rather than %s, so that each page will have it’s own custom title rather than the site title. For HOME PAGE TITLE we left it as %s which inherits the site title setting. You can find the site title setting by mousing over in the upper left of the home page (you can also set the favicon here). You can also find this information under DESIGN. Finally to set the title tag and meta description for each page: Click on pages, mouse over the page you want and then click on the gear icon. Fill in “Page Title” and “Description” under “Basic”. You also have control over the “URL slug” which is another good place for keywords. If this all seems a little overwhelming, yes, it will take some getting used to. Squarespace has gotten dings from other bloggers for having not the most intuitive UI. However it is definitely workable and the Squarespace support pages are helpful. Not quite a thumbs up as it can be confusing to set the tags. If you serve a local market you need to pay attention to this sometimes overlooked SEO factor. Structured data can help Google have a better understanding the meaning behind the information on your page. A fancy word for this is “semantic” as in the “semantic web” which is evolving our machines to interpret data in the context of relationships. The last entity is critical for local SEO, which helps many local businesses get the desired red pin and rank in the Google map results. The markup appears to be using the business address rather than physical address, but I would fill in both just to be safe. 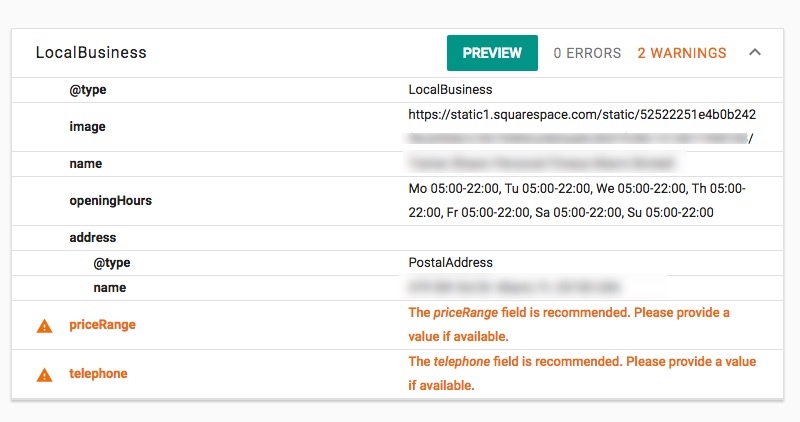 The Google’s structured data testing tool reported 2 warnings for missing telephone number (which was indeed entered and not blank) and price range fields. Since the telephone number is an integral part of the NAP (name, address, phone number), the identifier that is used by search engines to map local citations to a site, I would be much happier if the phone number was present in the LocalBusiness markup. Especially since it has been entered into the backend! Squarespace has acknowledged this as a bug. My recommendation is to make sure your business’ NAP is published on each page of your website (which you should be doing anyway for local SEO) as a partial workaround. Here is where I ran into a bit of a problem with Squarespace, or at least the theme we were using. The theme is a parallax style theme that provides a longer home page with menu items that when clicked jump to a lower portion of the same home page. The problem? Is that this setup created separate indexable almost empty pages for each menu items. Which is not ideal for SEO. You want only your awesome pages in the search engines indices, not low quality pages that will dilute your “good” pages. In many systems, you can check a box to “noindex” a page, which tells the search bots to crawl it but not put it into the index. You can do this (nonidex a page) in Squarespace, but it’s a little more involved as there is no simple checkbox. You will need to navigate to each low quality page that needs this tag, edit the page and then click on “Advanced” and type in the above code. Only do this if you are finding low quality pages for your site in the Google index. One rather confusing thing is that I found that the code injection (which had meta robots set to “index”) for the entire site overrode the individual page setting which seemed rather counterintuitive and required a call to Support to get cleared up. You can find the code injection dialog for the site under the Advanced settings. This is a good place to add your Google Analytics or Google Tag Manager tags. Squarespace gets a lower mark here because it’s not straightforward. Squarespace provides free SSL certificates and automatically will generate one for you. This is a major benefit of using the platform and you should take advantage of it, especially since they have made it so easy. Using HTTPS does give you a small SEO edge over sites that are not using HTTPS. They have provided a nice page that provides an explanation of HTTPS and SSL certificates and how to enable it on your site. 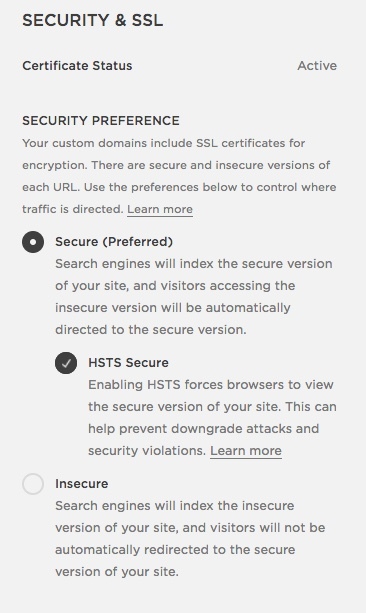 You can also enable the HSTS policy, which I recommend, as it adds even more security. This essentially forces any internal link on your site to use HTTPS even if it is not specified. Note that per their documentation it can take up to 72 hours to generate the SSL certificate when you initially set it up. You can find the Security and SSL settings under “WEBSITE” in the settings menu. This is another thing that Squarespace automatically takes care for you, it dynamically generates and keeps up to date a special file that lists all your site’s URLs. Think of it as a map for the search bots. Find out more about Squarespace XML sitemaps here. Be sure to set the alt tags on your images so that the defaults are not used for the titles of the images in the sitemap. Automatic XML sitemap generation is half the battle. The other half is submitting the sitemap to Google Search Console (and Bing Webmaster Tools). So make sure you do this extra step. The below infographic has a summary of each of the seven factors and a grade. Overall I’m favorably impressed with Squarespace’s handling of SEO. It’s nice that it handles many SEO aspects automatically for you. If you want ultimate control over the optimization of your site, Squarespace may not be for you. However for many small business owners, as long as they are prepared to spend time finding their way around the backend, Squarespace provides what you need to optimize your site for SEO.